The intersection of good taste. Last weekend was a total soup weekend. It was cold, it snowed like six inches on top of the six we already had, and I was in no mood to venture out to grocery shop so instead decided to shop my pantry. I had sweet potatoes. I had carrots. I had onions. I had vegetable stock. Done and done and done and done. With baking you have to stick pretty close to actual recipes but with cooking you can be more free and soup is an especially easy arena in which to experiment. Some of my favorite soups (and salads for that matter) have been a result of the mix of ingredients I happened to have on hand at that moment that all worked together to create something better than the sum of their parts. This soup is full of orange vegetables– you know, the kind that make you see further and help prevent cancer. Totally awesome. Added bonus: it tastes good too. Don’t fret if you don’t have an immersion blender, (though I highly recommend investing in one) you can puree this soup in batches in a blender or a food processor. Or you could even leave it chunky– that would be great too. Totally up to you. Experiment! Melt the butter in a large pot. Add the onion, cover and cook over moderately high heat, stirring occasionally, until softened. 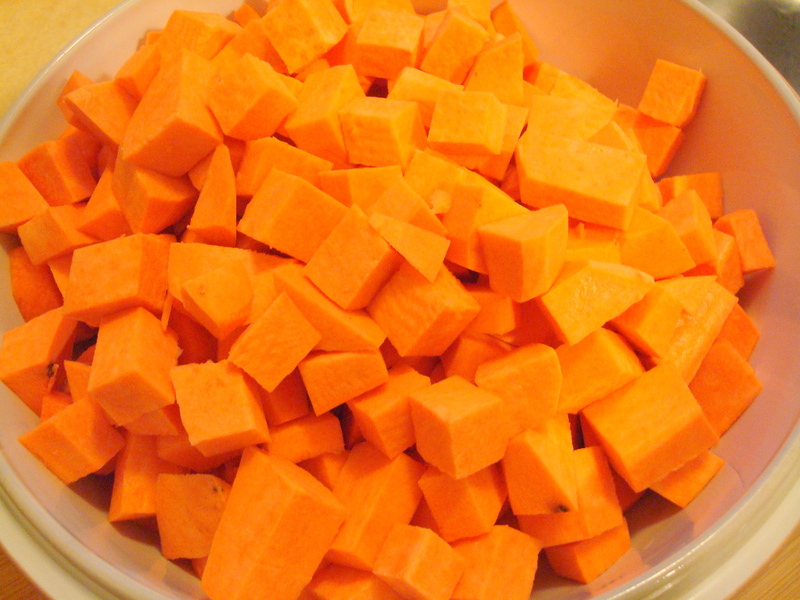 Add the carrots and sweet potatoes, cover and cook, stirring once, until the vegetables are just beginning to soften, about 2 minutes. Add the tomato paste and vegetable or chicken stock and bring to a boil. 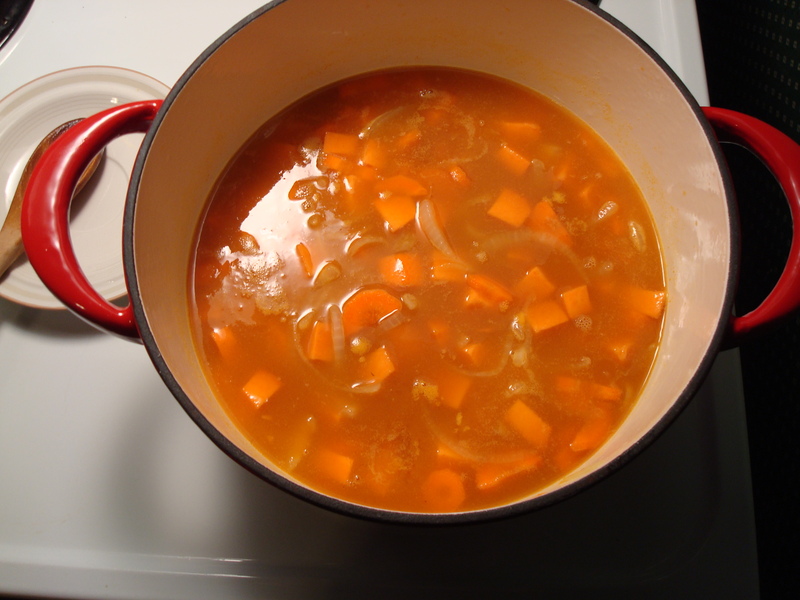 Reduce heat to low, cover pot and allow to simmer for approximately 30 minutes or until vegetables are softened. Using an immersion blender, puree soup until smooth. 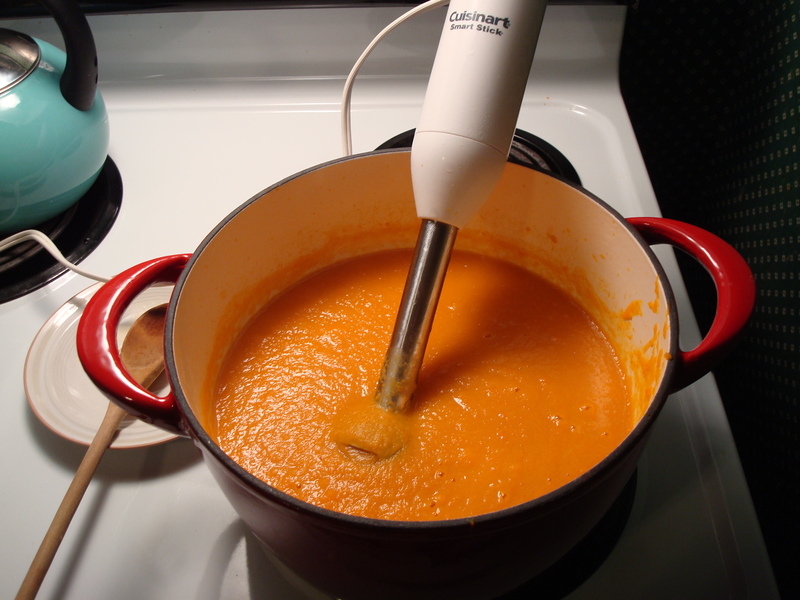 If you do not have an immersion blender, transfer soup to blender or food processor in batches and puree until smooth.